As Congress returns for a monthlong legislative stretch, Cabinet members will make long-awaited appearances, lawmakers and the White House will work to avoid financial crises, tax talks will heat up, and midterm election-watchers will seek clues about who's running. What will Scott Pruitt say? Congress is certain to hear this month from U.S. EPA Administrator Scott Pruitt, Energy Secretary Rick Perry and Interior Secretary Ryan Zinke for the first time since their confirmation hearings earlier this year. All three are due before House and Senate authorizing and appropriations committees to defend President Trump's fiscal 2018 budget. Zinke is already on the agenda for this week (see related story). Pruitt, a pariah among Democrats for his fierce opposition to the Clean Power Plan, is likely to face bipartisan criticism over a proposal to cut the agency's budget by 31 percent. Both parties have said the plan is dead on arrival. Pruitt is also likely to get plenty of questions about Trump's decision to exit the Paris climate accord. While Democrats will bash him for his anti-Paris advocacy, conservatives like home-state ally Sen. Jim Inhofe (R-Okla.) will praise Pruitt. Zinke will likely face queries, especially from House Natural Resources Chairman Rob Bishop (R-Utah), about whether he will recommend the administration revoke or reduce 27 national monuments, including Bears Ears and Grand Staircase-Escalante in Utah. Zinke will have an ally in Senate Energy and Natural Resources Chairwoman Lisa Murkowski (R-Alaska) on a budget proposal to open up the Arctic National Wildlife Refuge for energy exploration, but she will likely take issue with other aspects of the spending plan. Perry, a former Texas governor, has kept a relatively low profile as he has visited DOE sites around the nation hoping to learn about a department he previously admitted to having little knowledge about. Perry's most pointed questions will come from appropriators over proposals to cut energy research that don't have much political support outside the White House. Sen. Maria Cantwell (D-Wash.), ranking member on ENR, will want an update from Perry on nuclear cleanup work at the Hanford Site in her state after a recent leak of radioactive materials there. Is the border adjustment tax dead? 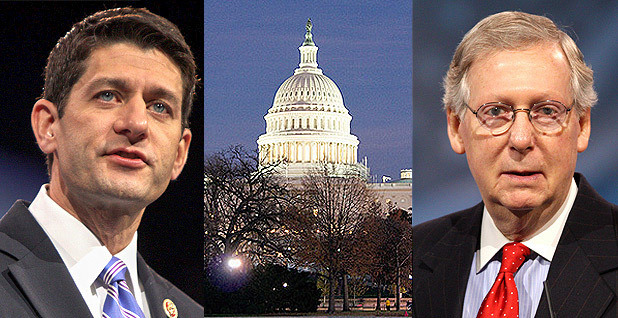 Congressional Republicans and the White House agree they want to move tax reform legislation. But it remains an open question whether a proposal riling the energy community will be a part of the package. The administration and congressional leaders are likely to accelerate talks over the shape of their tax bill this month as they press toward what seems like a long-shot August deadline. Lawmakers are sure to note the six-figure digital advertising campaign launched last week by the Koch brothers-backed American for Prosperity that pushes Republicans to move an overhaul without including what's been its most controversial proposal, a border adjustment tax. The BAT, championed by House GOP leaders, would create a 20 percent tax on imports while exempting exports. Backers argue the policy shift is vital to raising $1 trillion in revenue over the next decade that would allow them to make the deepest cuts in corporate and individual rates since the Reagan years. Senate Republicans, including Majority Leader Mitch McConnell of Kentucky, however, have suggested the BAT won't fly in their chamber amid concerns it would unfairly hit oil importers and other manufacturers. Members of the conservative House Freedom Caucus have also begun warning that the BAT could sink tax reform. The administration has offered reservations, too. House Speaker Paul Ryan (R-Wis.) has signaled some openness in recent weeks to BAT "alternatives," but the man to watch for signs of a deal is House Ways and Means Chairman Kevin Brady (R-Texas), who continues to press for the idea. Will Congress skip energy and enviro spending bills? The White House and Capitol Hill Republicans will be looking for ways over the next several weeks to avoid a politically treacherous fiscal meltdown this fall. House Republicans are floating the idea of wrapping all 12 fiscal 2018 spending bills into an omnibus package that they would move before August recess. The decision could help avoid a possible government shutdown when the new fiscal year begins Oct. 1. It would also sidestep messy floor fights over attaching riders to individual spending bills, particularly ones covering energy and water and Interior and EPA. Conservatives could still balk at moving massive spending legislation, and Senate Democrats have the votes to filibuster any omnibus that ignores their funding priorities. Meanwhile, Treasury Secretary Steven Mnuchin surprised many observers recently by suggesting Congress will need to sign off on a clean increase of the nation's borrowing authority, also known as the debt ceiling, before its August recess. Without an increase, the U.S. would default on billions in loans and risk starting a global financial crisis. But many lawmakers on Capitol Hill thought the increase would not be needed until fall. Conservatives, including many members of the Freedom Caucus, have come out against Mnuchin's plan, saying they will require at least a framework for future cuts to go along with any debt increase. Such sentiments echo Office of Management and Budget Director Mick Mulvaney, a former House hard-liner who directly contradicted Mnuchin in comments last week. He also wants spending adjustments. If the 30 or so members of the Freedom Caucus hold together, they could force leaders to rely on Democrats to pass a debt ceiling increase. But House Minority Leader Nancy Pelosi (D-Calif.) said Friday that Democrats might not back even a clean raise if the GOP moves ahead with a tax plan that favors the wealthiest Americans. Almost six months into 2017, many questions remain about next year's midterm elections. Former House Energy and Commerce Chairman Fred Upton (R-Mich.) continues to eye a possible challenge to the Great Lakes State's senior Sen. Debbie Stabenow (D) next year. It would surely be one of the most competitive and expensive races of the upcoming cycle. Stabenow is already in campaign mode, and the Democratic Senatorial Campaign Committee has run pre-emptive online ads against Upton. The strength of his fundraising numbers for the first half of the year, due on June 30, could offer some hint as to whether he'll pursue the challenge. So far, no sitting senators have announced they will not seek re-election in 2018, one of the longest stretches in recent history. The biggest retirement questions surround the future of the longest-serving Republican, Sen. Orrin Hatch of Utah, the chairman of the tax-writing Senate Finance Committee. The seven-term senator has danced around the issue, first saying he would retire and then suggesting he was eyeing another run. Hatch, 83, has floated 2012 Republican presidential nominee Mitt Romney as his possible replacement. Other potential retirees on the Democratic side are: Sens. Dianne Feinstein of California, 83; Tom Carper of Delaware, 70; and Bill Nelson of Florida, 74. All three have said they expect to run and would be favorites to win, but they all have been subject to frequent speculation about those plans changing. One definite retirement is coming at the end of the month, with House Oversight and Government Reform Chairman Jason Chaffetz (R-Utah) leaving Congress. The House Republican Steering Committee will meet this week to pick his replacement, with Rep. Trey Gowdy (R-S.C.) strongly favored to get the gavel.